Hi friends! 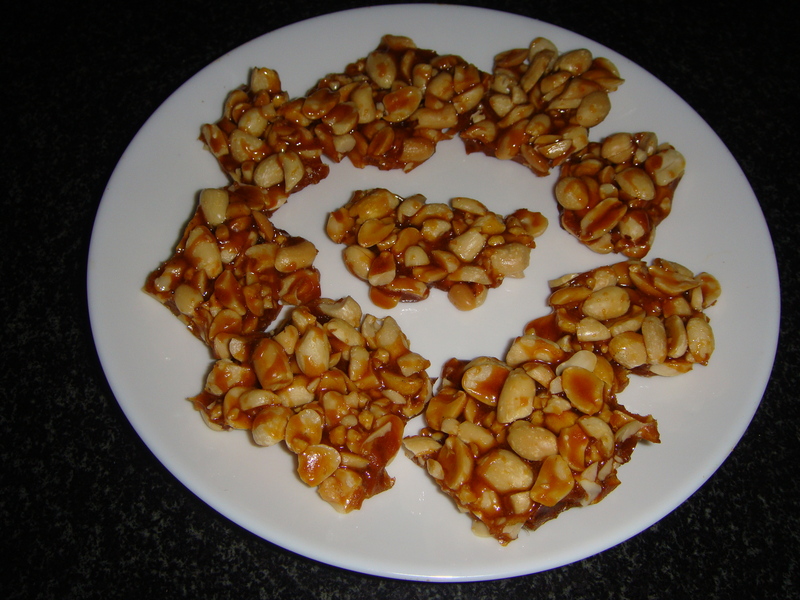 A tasty peanut brittle or chikki made with jaggery. It is an excellent snack to enjoy in winters . Peanuts can be roasted in the microwave oven. Peanuts spread out one layer deep in a microwave safe dish, heat for one minute. Take out the dish, shake and mix the peanuts and once more put in the microwave for one more minute.Take out from the microwave, cool to room temperature, keep aside. Coarsely crush the roasted peanuts and keep aside. On medium flame heat the ghee in a pan add jaggery ( without water) till it melts. Cook the syrup for six to seven minutes on slow fire. Add the roasted and crushed peanuts and mix well. Grease a tray and spread the mixture evenly, roll it flat to desired thickness.Cut into squares when hot, when cooled separate the pieces and store in an airtight container. Helps Promote Fertility (Folate)Peanuts contain a good amount of folate. Aids in Blood Sugar Regulation (Manganese) a mineral which plays a role in fat and carbohydrate metabolism, calcium absorption, and blood sugar regulation. Helps Prevent Gallstones-It may come as a surprise that peanuts can help prevent gallstones. Helps Fight Depression (Tryptophan) –Peanuts are good sources of tryptophan, an essential amino acid which is important for the production of serotonin, one of the key brain chemicals involved in mood regulation. When depression occurs, a decreased amount of serotonin may be released from the nerve cells in the brain. Tryptophan may raise serotonin’s antidepressant effects when there is an increased amount of serotonin in the blood. Boosts Memory Power (Vitamin B3) –Do you know what can be found in peanuts that gave them the “brain food” tag? This is due to their vitamin B3 or niacin content whose many health benefits include normal brain functioning and boosting memory power. Helps Lower Cholesterol Levels (Copper) –The same nutrient which gives peanuts their memory enhancing power also helps lower and control cholesterol levels. Added to that is their copper contents which aids in reducing bad cholesterol and increase good cholesterol levels. Lowers Risk of Heart Disease-Peanuts are rich in heart-friendly monounsaturated fats and antioxidants such as oleic acid. Reach for a handful of peanuts and other nuts at least four times a week to reduce your risk of cardiovascular and coronary heart disease. Protects Against Age-related Cognitive Decline (Vitamin B2)-the most niacin-rich foods like peanuts were 70% less likely to have developed Alzheimer’s disease. 9 Cancer Protection-a form of phytosterol called beta-sitoserol (SIT) is found in high concentrations in some plant oils, seeds, and legumes including peanuts. Phytosterols not only protects against cardiovascular disease by interfering with the absorption of cholesterol, they also protect against cancer by inhibiting tumor growth. Lowers Risk of Weight Gain-Surprise! Eating nuts regularly is associated with a lowered risk of weight gain.